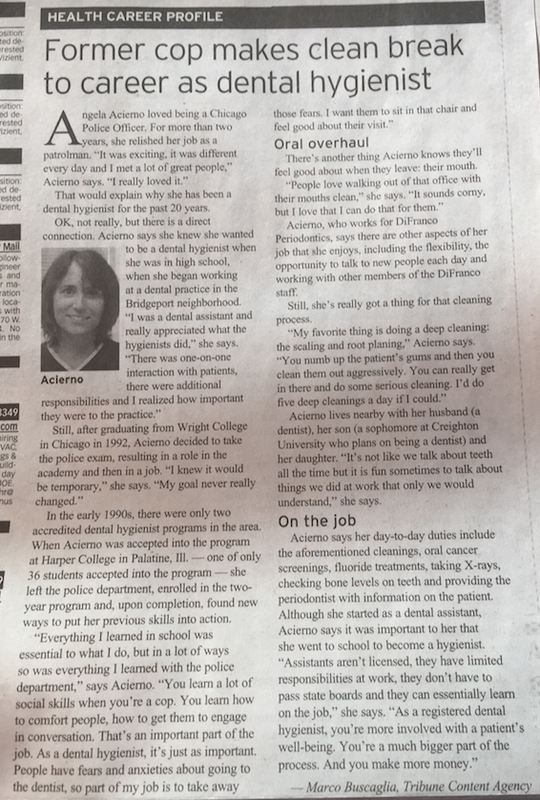 Dental hygienist, Angela Acierno, was featured in the Chicago Tribune! Severe gum disease increases the risk of death in chronic kidney disease patients, a new study suggests. NYTimes “Well” Blog Considers Whether To Floss Or Brush First. The New York Times (5/29, Saint Louis) “Well” blog considered the question of whether to floss before or after brushing the teeth. Although “flossing first isn’t necessarily better for oral health than the other way around” ADA spokesman and professor of restorative dentistry at UCLA Dr. Edmond R. Hewlett “recommends flossing first” because that way you “get the unpleasant task out of the way to avoid the temptation to not do it,” as the Times put it. The Times went on to point out that flossing is less important for cavity reduction than it is as a method of maintaining proper gum health. Said Dr. Hewlett, “Gingivitis is the first step in losing your teeth,” adding, “The nice thing about catching inflammation when gums are bleeding is you can reverse it then, if that’s all that’s going on,” with proper flossing and brushing. Consumers Should Look For ADA Seal Of Acceptance When Buying Toothpaste. The Ladue News (MO) (5/15, Mitchell) reports on what to look for when purchasing a toothpaste. One dentist noted that fluoride “is the most important ingredient in toothpaste,” since “numerous clinical trials have shown it to be effective against tooth decay, and most toothpastes in the United States contain fluoride.” The dentist also “suggests consumers look for the American Dental Association (ADA) seal when purchasing toothpaste,” noting that while the FDA has various requirements for products, it does not test them, but the ADA “conducts extensive testing to determine whether they meet specific criteria for safety and effectiveness,” the dentist said.